Use this list to find the files you want quickly. Return to the Contents page to see the list of pages. If you would like to see the structure of the site please use the Site Map. If you would like to enter your own data into a useful spreadsheet file the empty spreadsheet below should provide a suitable one. Read more about them on the Weather Data Page. This empty spreadsheet file allows you to fill in basic weather and see it graphed. It has columns for temperature and rainfall. This empty spreadsheet file allows you to fill in weather information including maximum, minimum and current temperatures, wind direct and wind speed and precipitation. It is automatically graphed. One completed example is provided - January 2010 Intermediate data file. This empty spreadsheet file allows you to enter in your weather data. It will make calculations and draw graphs for you. This is the detailed version. The files below are completed spreadsheets of weather for Tamworth, Staffordshire, United Kingdom for the years 2009 to the present. They contain many readings, calculations and graphs. All data refers to the 'climatological day.' This means that maximum, minimum and rainfall are recorded for the day the recordings are taken. This is the case even though they may have occurred on the previous day. See more details about the specific readings on the Weather Data page. These files contain 'thrown back' data. Both the maximum temperature and the rainfall data is 'thrown back' so that is is comparable with other locations. See more about this here. The files below are completed spreadsheets but contain only the temperature and rain data. They are less complex, but still contain useful graphs and calculations. Remember that the rain data recorded at 09.00 is entered for the previous day as that is when most of it fell. This sheet gives more detailed information on calibrating thermometers. It also includes some hints about how to read tenths of a degree on the scales of thermometers. See the introduction on the Temperature Page. This sheet provides a chart for recording the results of the calibration of a set of thermometers. See the introduction on the Temperature Page. This sheet provides a framework for recording the results of research on climate. More details of the activity can be found on the Weather Round the World page. This spreadsheet has cells ready prepared for entering climate data from the data sheet. More details of the activity can be found on the Weather Round the World page. This spreadsheet is ready filled in with data as an example. More details of the activity can be found on the Weather Round the World page. This image can be loaded into a paint package and used with the fill tool to create colourful pictures. See more about it on the What is Wind? page. This is an empty grid for recording the data on. Put it on a clipboard to take with you when you collect the data. 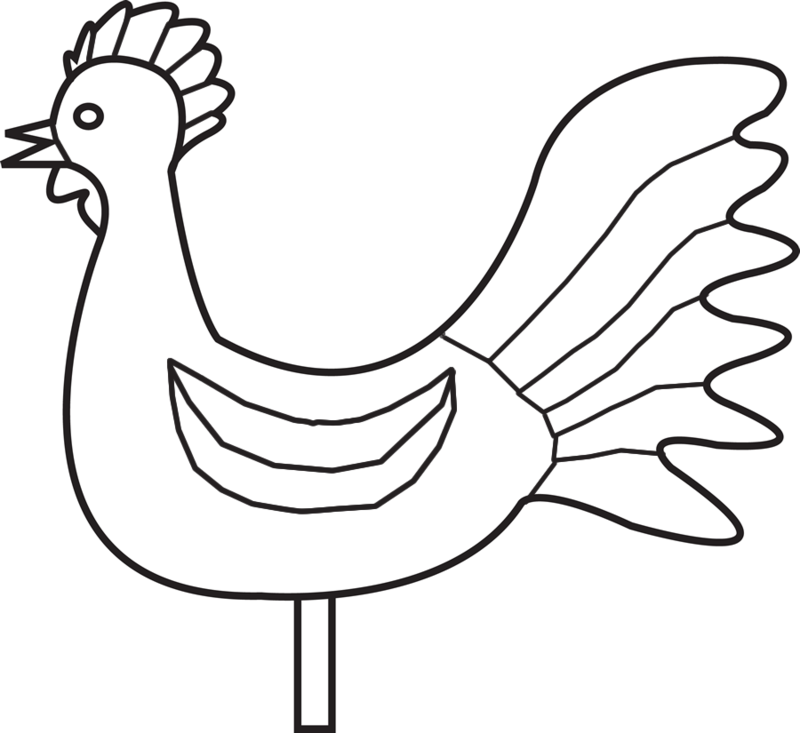 Make your own weather vane design. Choose something you are interested in to be the sail. Make sure that more of the sail shape goes behind the centre point than in front. This means your sail will work well. You could make a card one to try it out. Details are on the Wind Measurements page. this file has notes on how to make a custom Google Map. It describes how to add markers, how to link to pictures and how to share the link. More details can be be found on the Weather Round the World page. This file explains how we cannot assume when the warmest and coolest parts of the day are. This topic is used to provide an activity for finding maximums and minimums in a spreadsheet. This spreadsheet has hourly temperatures for the 15th of each month in 2011. The task is to locate the maximums and minimums and note when they occurred. This relates to the worksheet above. This spreadsheet develops the work above. It shows three different graphs of the hourly temperatures on 15th February 2011. The different y axis scales produce very different graphs. This prompts one to think about the importance of making graphs comparable. It is especially relevant when spreadsheets choose their own scales for graphs. Find out what caused the amazing icicles in the photograph on the Below Freezing page. Look at the weather vane designs on this sheet. Think about which ones will work well and which ones will not work so well. Write some notes next to each design to say what is good and what is bad. Details are on the Wind Measurements page. This sheet can be used as a stimulus for discussion about the siting of a Stevenson Screen. See more on the More About Setting up Your Weather Station page. This page has many URLs on how to make a paper windmill. The user can decide on the best bits of each set of instructions and come to a conclusion about what is best for the pupils who will be undertaking the task. See more details on the Making a Wind Measurer page. These notes show how the wind measurer described in the Under Fives Windy WEather pages is constructed. Detailed pictures are included. See more details on the Making a Wind Measurer page. See more about these activities on the Sixes Thermometer page. These notes explain about maximum, minimum and current temperatures. Use this sheet to find out where the sun shines at different times of the day. This will help find out where to site a weather station, and which way the door should open. This is described on the Setting Up page. Look at this file to see why you should take your temperature readings in the shade. It shows how the sun shining on the thermometers can give a reading which makes it difficult to compare. If you take the readings in the shade the readings will be more consistent, and you will be able to compare them to other people's readings. The activity is described on the More About Reading Temperatures page. This MS Excel file has four months of soil temperatures at 20cm, 30cm, 50cm and 1metre. Look at the graphs to see how slowly or quickly the temperatures change. Another graph compares the maximum air temperature to the 1metre soil temperature. Lots of scope for discussion. The activity is described on the More About Reading Temperatures page. This MS Excel spreadsheets shows the relationship between the grass and the concrete temperatures. It is not easy to find a pattern, or think of a reason for any pattern. The activity is described on the More About Reading Temperatures page. This blank spreadsheet is set up to help work out what to buy for a weather station. This supports the Weather Apparatus page. Send the filled in form to us using the Contact Us link. We will try to put some of the reports up for other visitors to see. These guidance notes help to make paper snowflakes with six points, just like the real ones. Included are some wonderful links to super websites. This template can be cut out and folded easily. It takes away the problem of estimating the angles to make six points instead of eight. These notes have some hints about what to look for in photographs when considering the weather. See more details on the Weather Round the World page. This is a sheet which provides a grid for recording vocabulary to make a poem on a particular theme. It can be used with Poem Maker, more detail of which can be found on the Teachers and Parents Page. This is a similar sheet to that above, but it has extra notes explaining what it is for, and links to where Poem Maker can be found. See more information on the Teachers and Parents Page. This is a txt file which can be loaded into Poem maker and used to make poems about the wind. It is useful as an example of what your finished file would look like. See more information on the Teachers and Parents Page. This example show a completed investigation to see if the weather is often the same as the day before. This links to an activity on the Forecasting the Weather page. This sheet contains a graph ready for entering data to enable a prediction of the minimum temperature overnight. This links to an activity on the Forecasting the Weather page. This sheet show a competed graph to show the predicted minimum temperature overnight. This links to an activity on the Forecasting the Weather page. This document has a diagram of the 8 points of the compass. Knowing these will help to record more accurate wind direction data. This links to the Wind Measurement page. This document has a clear diagram of the 16 points of the compass. Knowing these will help to record more accurate wind direction data. This links to the More About Wind page. This document gives some guidance on how to record humidity readings using a wet and a dry thermometer. It provides a chart for entering the data. See the Humidity page for more information. This worksheet can be used to record the findings of your research about renewable energy. Choose from those that use weather related power - solar, wind, wave and water. If you need more help use the hints sheet. This Flash file is a platform game which demonstrates how a weather theme can be used to support an early version of computer programming. Use this to design a postage stamp on a weather theme. See more details on the General Interest page. This grid can be used with the suggested link and hints to find out about what tornadoes do in the USA. Find out all about the gods on the Tower of the Winds in Athens. Why was each god chosen for each different wind direction? Read their names in Greek. Read background information on the Tower of the Winds. Discover how you can do some research on the winds in your area and design your own replica. Draw gods that fit in with your local winds. Add windows and doors. Cut out the net and stick it together to make the 3D model. This weather box has been easily constructed from one piece of wood. It does require some ability to measure, saw and drill. It also requires painting. See more about it on the Weather Boxes Page. This easy-to-make wooden weather box is useful for housing a digital maximum and minimum thermometer, or the sensor for a remote weather station. See more about it on the Weather Boxes Page. This weather box needs a little more skill, but still can be made fairly easily. It will provide room for both a maximum and minimum thermometer and a wet and dry thermometer. See more about it on the Weather Boxes Page. This weather box has been designed to house a maximum and minimum thermometer. To see it in use look at the video on the Six's Thermometer Page. As it is made from plastic is does not need to be painted, and should withstand the elements fairly well. See more about it on the Weather Boxes Page. This weather box is a little complicated to make but well worth the effort. The finished box is roomy and the double louvres are similar to the ones on expensive bought boxes. See more about it on the Weather Boxes Page. This screen can be used to house a sensor from a digital thermometer like the one in the image above. It will keep the sun, wind and rain off the sensor. See more about it on the Weather Boxes Page. This weather box has also been designed to house a maximum and minimum thermometer. You can see a video of it in use on the More About Setting Up page. See more about it on the Weather Boxes Page. This webquest asks you to use several of the pages on the website to answer some precipitation questions. Type your answers into the MS Word document containing the questions. This webquest asks you to use several of the pages on the website to answer some temperature questions. Type your answers into the MS Word document containing the questions. This webquest asks you to use several of the pages on the website to answer some wind questions. Type your answers into the MS Word document containing the questions. This is quite a large file, so allow time for it to download. Right click and save if you want to have it to put in another file (e.g. IWB). See notes on how to use it on the What is Wind page. Where should you put your Weather Vane? Use this sheet to investigate where weather vanes should be put. The notes are on the More About Setting Up page. Where will you put your Weather Station and Rain Gauge? This sheet ask you to annotate the different pictures to explain the good and bad points about the various locations. The notes are on the More About Setting Up page. This contains details of what needs to be got ready. This single document has a page for each year group. It is intended for use in the classroom. The activities for each year group outlined in detail. This sheet is filled in by each year group when they research the weather in their allocated location. The temperatures from all of the locations researched can be filled in on this sheet for comparison. All of the temperatures can be typed into this spreadsheet which will automatically graph the data. Some photographs to help explain the activity are on this sheet. They are hyperlinked to larger photographs online. There is some explanatory text. This sheet can be printed out and the arrows and dot cut out and laminated for use on a map. this relates to the Under Fives work on windy weather. See how to use them on the What is Wind? page. 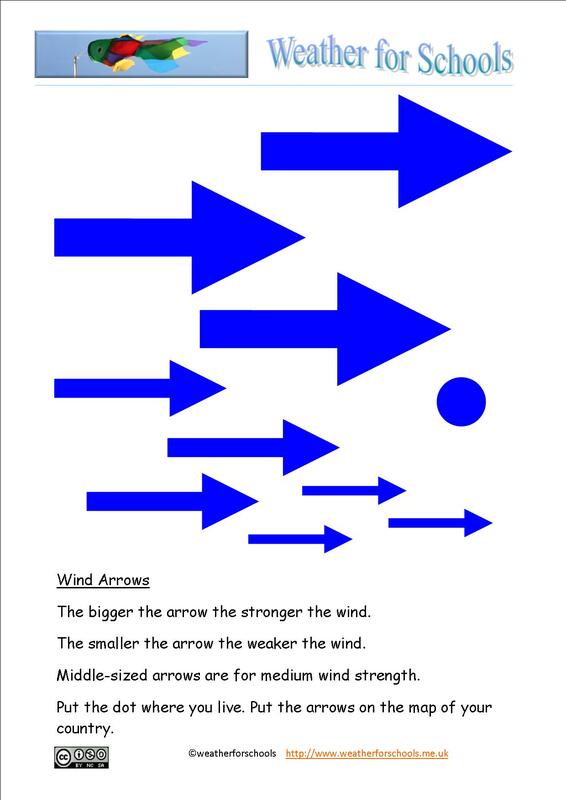 This Flash file is an activity where the children can record their observations of the wind by using different sized arrows which can be dragged onto a map. See more about it on the What is Wind? page. This Flash file is an activity where the can have a go at decorating a wind measurer in the virtual world. It provides an opportunity for discussing likes and dislikes, and gives more experience of dragging and dropping. See more about it on the Making a Wind Measurer page. This simple recording sheet is intended for use with the Under Fives work on windy weather. It can be used as a group, or able individuals may like to use it for homework. See more details on the Making a Wind Measurer page. This uses the eight points of the compass. Print out the sheet and colour in a square for each day's wind direction. Start in the middle, next to the wind direction letters. This uses the eight points of the compass. Print out the sheet and colour in a square for each day's wind direction. Start in the middle, next to the wind direction letters. This has the addition of the idea of including a letter to show what weather the wind brought. This uses the eight points of the compass. Fill in squares of the spreadsheet to record the wind direction each day. Choose colours depending on the weather of that day. You might see a pattern for what weather each wind direction brings. This relates to the investigation spreadsheet above. This is an example that has been filled in. It gives an idea of the results you might have. This spreadsheet file is all ready for you to enter your wind direction data. It will automatically graph your data in the form of a wind rose. It is designed for data using the eight points of the compass. This spreadsheet file is all ready for you to enter your wind direction data. It will automatically graph your data in the form of a wind rose. It is designed for data using the sixteen points of the compass. This spreadsheet file relates to the two items above. Data has already been entered so that you can see the type of chart it produces. This example uses the sixteen points of the compass.. This sheet can be printed out and words used as signs on a display for the Under Fives windy weather topic. These can be used on a display to go with activities outlined on the Windy Weather page. This summarises the Windy Weather topic for the Under Fives. This is provided as a means of printing out the material for easy reference. This can be with activities outlined on the Windy Weather page. This sheet is a framework for recording data from a multimedia map. Its use is described on the Weather Round the World page.